Renault has developed a new concept electric vehicle that will go on trial with European fleets to help address the challenges presented by last-mile deliveries. Building on the EZ-Pro concept unveiled at last autumn’s IAA Commercial Vehicles Show at Hannover and going on trial with a number of fleets, the EZ-Flex provides a compact footprint of 3.86m long, 1.65m wide and 1.88m to enable access, including to carparks, while still offering a 3m3 load capacity, optimal rear loading via an ergonomic loading height and adaptable loading configurations. Its excellent use of space is helped by its compact cockpit, which features a clear central dashboard for quick and easy access to driving information, excellent visibility and simple and efficient controls. A range of connected services and applications are possible and the concept can integrate further applications linked to various professionals’ activities. It also feature a 4.5m turning circle to aid city centre manoeuvrability and offers a claimed 100km (62-mile) range. 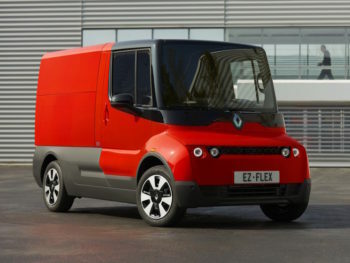 The EZ-Flex concept will debut on the Renault stand at the Viva Technology fair from 16 to 18 May 2019 at Paris Expo Porte de Versailles in France, but 12 units are also going on trial for around two years with professionals, companies, cities and municipalities in Europe. The trial will gather data on areas including geolocation, mileage, range, use of cargo opening, speed and stops understand the reality of daily use and help guide the design of future urban delivery vehicles for Renault.